It’s not enough just to want something to manifest it. You’ve got to try “thinking in a certain way” to attain it. Thinking in a certain way is how Wallace D. Wattles, author of The Science of Getting Rich, describes the need to have a clear image of your goal. In my latest video based on his work, I explain how it can work for you. Wallace was a pioneer in realizing and writing about the power of your mind. In his book, he explains and shows us how to use that power to better our lives, become successful, and to expand our creativity. Remember the man in the Gratitude video # 3 who formed the mental image of his house in order to manifest it and you will have a fair idea of this initial step towards getting rich. In other words, its important to create a clear and definite mental picture of what you want; you cannot transmit an idea unless first you have it yourself. You must have it before you can get it. Many people fail to impress “thinking substance” because they themselves only have a vague concept of the things they want to do… to have.… or to become. It is not enough that you should have a general desire for wealth, everybody has that. When you try to impress your thoughts on Substance, remember that it must be done by a coherent statement; you must know what you want, and be definite. You can never get rich, or start the creative power into action, by sending out unformed longings and vague desires. Go over your desires just as the man I have described went over his house; see just what you want and get a clear mental picture of it as you wish it to look when you get it. You must have that clear mental picture continually in mind as the sailor has in mind the port toward which he is sailing the ship. Spend as much of your leisure time as possible in contemplating your picture. The clearer your picture and the more you dwell upon this picture the stronger your desire will be and the stronger your desire, the easier it will be to hold your mind fixed upon this picture of what you want. Behind this clear vision must be the purpose to realize it. See the things you want as if they were truly around you all the time. See yourself using them. Dwell on your mental picture so it is clear and then take the mental attitude of ownership with the faith that it is yours. And remember gratitude and be thankful for what you are visualizing as if you already possessed it. You do not make this impression by repeating a strings of word; you make it by holding the vision with unshakable PURPOSE to attain it with unrelenting faith. Remember it is faith and purpose in the use of the imagination which make the difference between the scientist and the dreamer. And having learned this fact, it is here that you must learn the proper use of the Will. We will cover that in part 5. 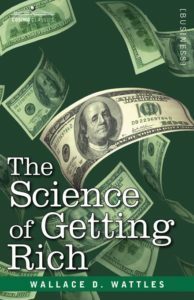 This entry was posted in Uncategorized and tagged abundance, Carole Dean, film funding, manifesting, Science of Getting Rich, Thinking in a Certain Way, wallace d. wattles by Richard Kaufman. Bookmark the permalink.